Tehran, 29 November 2005 (CHN) -- An earthquake measuring 5.9 on the Richter scale struck Qeshm Island on November 27, destroying the eastern wall of the historical Portuguese fortress before excavations were carried out on that section of the site. 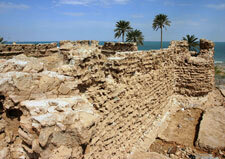 Portuguese Fortress is situated in the northern part of Qeshm Island and on Persian Gulf shores. The fortress was built in 1507 by order of Albuquerque, Portuguese admiral in Qeshm Island. Ehsan Yaghmayi unearthed the fortress in 1999, and carried out archaeological excavations there until the spring of 2000. "During the excavations in the Portuguese fortress which took from 1999 to 2000, 3 of the 4 walls were excavated both from inside and outside," said Ehsan Yaghmayi. According to Yaghmayi, the eastern wall of the fortress was supposed to be excavated within the next few months, however the earthquake destroying the wall caused the work to remain incomplete. During excavations in Portuguese Fortress in Qeshm Island, some chinaware dishes from China, glasses from Venice, and cannons were discovered. Portuguese Fortress was built to establish relations with Hormoz Fortress and providing services and equipments for this central fortress of Qeshm. Portuguese Fortress is an important evidence from the Portuguese occupation of the Persian Gulf region. Portuguese Fortress was captured during the Safavid era by Imam Gholi Khan, one of the commanders of Shah Abbas.